Book in One Word: Okay. Reviewing this is hard. 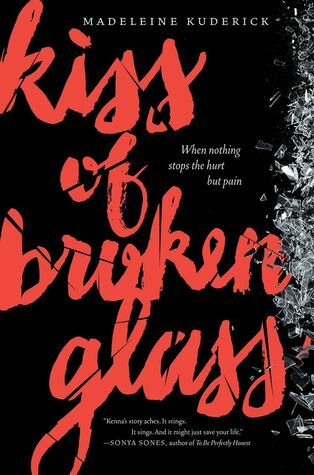 Kiss of Broken Glass wasn't a bad book. However, its execution made the entire thing pretty forgettable and left me feeling nothing. It has some great elements, but put together, they just don't work. The synopsis may say it "pulses with emotion and lingers long after the last page," but for me, it did not. Kiss of Broken Glass is a novel about cutting that's written in verse. I don't have a problem with either of those, but they're not compatible with each other in this novel. I've read a few books written in verse, and I think this did that well. At the core, Kuderick's writing is good, and she has some great metaphors and diction. However, with this subject, the verse took away any feeling. It cut out the emotion of the story, which should exist with this subject. It may have worked better if this book was longer, but at 224 pages, it's practically nothing. There wasn't enough depth, I didn't feel anything toward the characters, and it was just missing something. If this was lengthier or not written in verse (not that I have anything against reading verse), this could have had something. This book (semi-based/inspired by the author's daughter, I think) is about Kenna, a fifteen-year-old girl who's sent to a psychiatric facility when she's found cutting herself at school. There are a few characters she takes notice of, but I didn't care too much about any of them. The synopsis suggests romance will ensue, but there really wasn't much of any and that was a bit disappointing (I like romance). There are attempts to get the reader to connect to Kenna and learn more about her, but again, I felt nothing. Although I did feel a little appalled at what was going on at Kenna's school. There, cutting is like a competition, and scars are as precious and glorious as diamonds. It's a contest. I'm not saying it's not true or unrealistic (remember when people were cutting themselves for Justin Bieber? ), but it's ridiculous and horrible. I get what Kuderick was trying to accomplish with this novel, and I think it's great. But writing this story in so few pages and in a short form of writing just did not work. Like I said, this book wasn't bad. It's just...there. I read it, I reviewed it, and now I'm done with it. And even though Kiss of Broken Glass didn't work for me, I am interested in reading other things Kuderick might write. I like the story and the idea and how we got to see how the mind of someone addicted to cutting worked. It's just that darn execution that took it down several levels. Did I like it? I didn't dislike it. Would I purchase it? Probably not. Who would I recommend it to? People who like verse, pretty prose, and short stories about darker subjects. I had a hard time with the fact that cutting was a competition in the book too. And I agree with you that it did not leave me feeling anything. The premise sounds good, but I'm not sure I would want to read it based on your reviews. I really want to read this because it's a verse novel, which I usually love, but I have such a hard time with the subject of cutting. Even your review - which has no detail about actual cutting - made me nauseous. I'm actually kind of afraid to even try this one because of the subject.